In large bowl, break up cookie dough. Stir or knead in 1/4 cup all-purpose flour until well blended. Divide dough in half; wrap each half in plastic wrap. Freeze 10 minutes. Heat oven to 350°F. Shape half of dough into 1 1/2-inch balls. With fingers, roll each ball into 10-inch rope, about 1/4 inch wide; carefully place on ungreased cookie sheets. With each rope, starting at top, make small spiral for head, continuing to make larger spiral for body, in an "s" shape. Cut hat shapes from gumdrops; place on heads. Use baking bits for buttons, eyes and noses. Cut small pieces from red gumdrop for mouths. Sprinkle with coarse sugar. Repeat with remaining half of dough. Bake 9 to 13 minutes or until edges are light golden brown. Cool 1 minute; remove from cookie sheets to cooling racks. 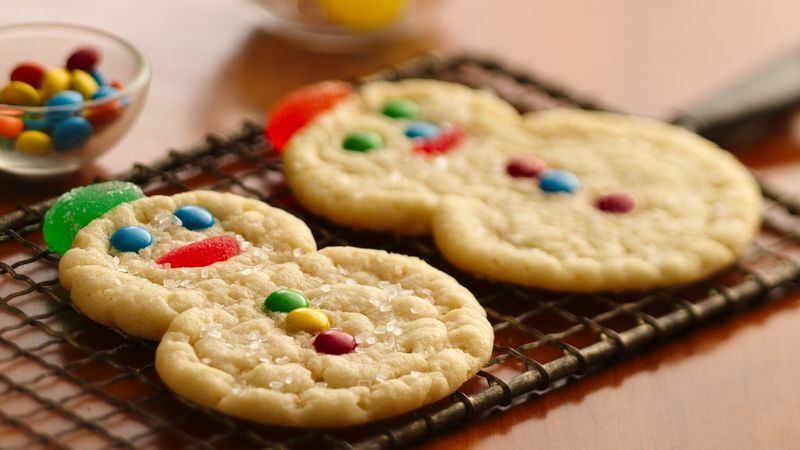 For Spiral Snowmen on sticks, simply insert a flat wooden stick into the bottom of each cookie before baking.